There is a wall in Ángel’s neighborhood. Around it, the community bustles with life: music, dancing, laughing. Not the wall. It is bleak. One boy decides to change that. But he can’t do it alone. This inspiring picture book celebrates the power of art to tell a story and bring a community together. John Parra is an award-winning illustrator of many books for young readers, including “Frida Kahlo and Her Animalitos” by Monica Brown, which was named a New York Times Best Illustrated Children’s Book, and “Marvelous Cornelius: Hurricane Katrina and the Spirit of New Orleans” by Phil Bildner, which won the SCBWI Golden Kite Award for Picture Book Illustration. His other awards include the ALA Pura Belpré Honors and the Christopher Award. Additionally, his books have appeared on Bank Street’s and Smithsonian Magazine’s Best Children’s Books of the Year lists. In 2015, John was invited by the Metropolitan Museum of Art in New York to present a special event about his work and career in illustration. His art can be seen at the U.S. Post Office on six new Forever Stamps titled “Delicioso”—with illustrated images celebrating Latino food cuisine. 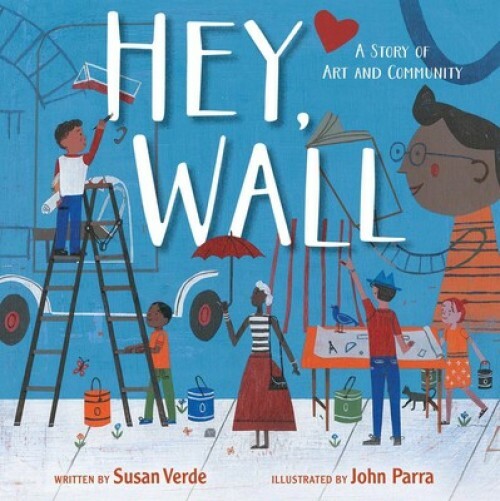 John’s most recent book, “Hey Wall: A Story of Art and Community,” with author Susan Verde, was released in the fall of 2018 to celebrated reviews. To learn more, visit johnparraart.com.